ST. GEORGE – Fresh off a win at the Utah State Cheer Championships, the Desert Hills High School cheerleading team is heading to nationals next month, then will regroup on home turf for new season tryouts. Patty Richardson, Cassidy Legg and Shana Barr coordinate general team activities, stunting and choreography, and tumbling, respectively. 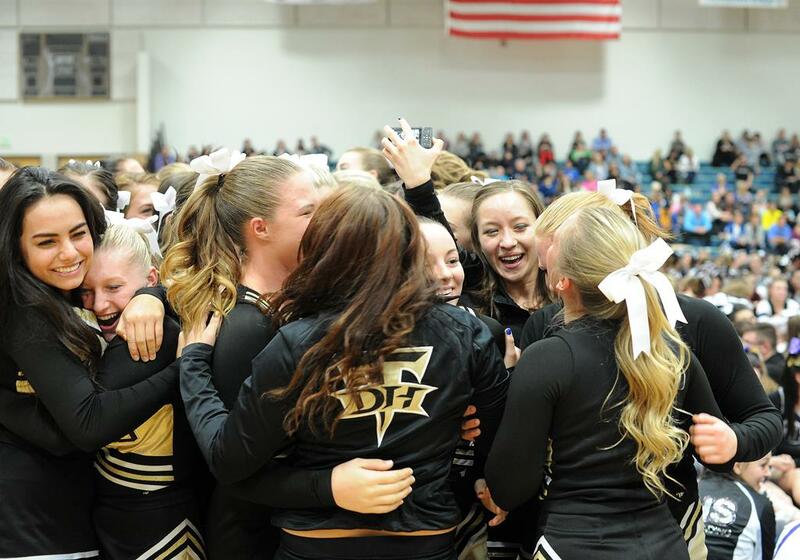 Over the last six years, the coaches and students have worked diligently to grow cheer in Southern Utah while making a name for Desert Hills in the sport. “I believe one thing that stands out in our program is that we teach the girls to dream big and don’t stop working until you get there,” Legg said. The 2013-14 season began with tryouts in April, followed by a summer camp competition and regionals in northern Utah and Las Vegas, a requirement to qualify for State on Feb. 15. Most of the team performed the night before the state competition at a home basketball game, while others were in Provo for the 3A State Swimming Championships. They convened at Juan Diego High School to perform a routine reconstructed only five days before competition due to the team captain sustaining an ankle injury. 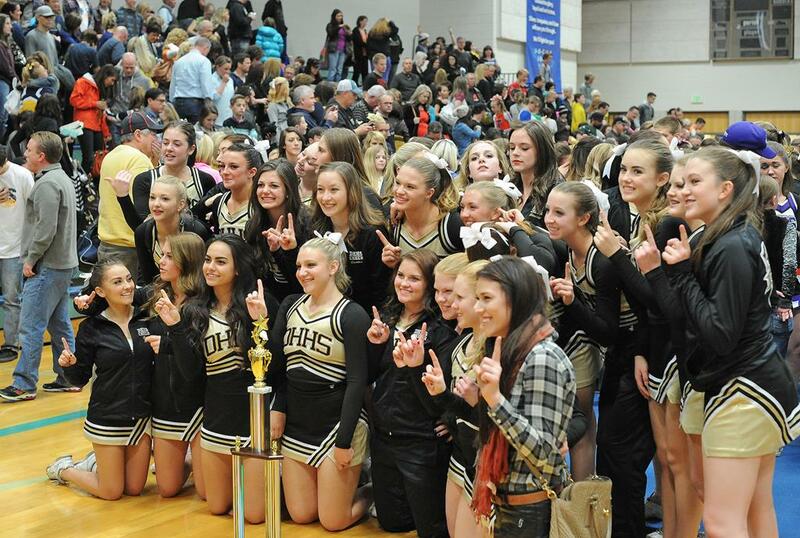 With only 2 minutes, 30 seconds to show off an entire season of practice in front of Principal Rusty Taylor and many proud families and classmates, Desert Hills won the 3A Varsity Girls Show Cheer division, beating other regional champions Morgan and Richfield. Seventeen-year-old team member Beth Purser said the innumerable hours of practice were well worth it. Away from cheer, the team is a collection of outstanding student-athletes who maintain an scholastic 3.85 GPA. Several have been named Deseret News/KSL Sterling Scholars. There is little down time in cheer. Next, the team will travel to Anaheim, Calif., for the USA Spirit Nationals competition March 28-30. Tryouts for the new season start March 31, preceded by an orientation clinic at the school, held March 3-5 at 3 p.m. Interested Desert Hills students may contact patty.richardson@washk12.org for more information. Utah State Cheer is a club sport established in 2013, though most participating schools had independently run cheer squads prior to its formation. The number of teams tripled this year, representing 3A, 4A, 5A and junior high schools across the state. Girls and coed teams showed off their “school fight song,” “sideline/timeout dance” and “show cheer” routines at two regionals and the state competition during the season. Though not sanctioned by the Utah High School Activities Association, cheer teams support UHSAA sports including football, basketball and wrestling at games and championships throughout the school year. Many participate in regional and national competitions for titles of their own. Abiding by the National Federation of State High School Associations philosophy that cheer should “provide the students with educational experiences and learning outcomes that contribute toward the development of the attributes of good citizenship,” the goal of Utah State Cheer is to cultivate not only excellent athletes, but youth ambassadors who represent their schools with pride.